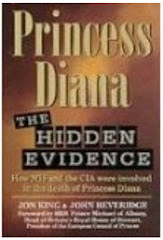 Princess Diana: Princess Diana Crash: Blood Sample Belonged To Suicide Victim Not Driver! Princess Diana Crash: Blood Sample Belonged To Suicide Victim Not Driver! Princess Diana Death: Blood Sample Exhibited All The Hallmarks Of Suicide Victim! It is now known that the blood sample cited in the official report as belonging to driver Henri Paul was not in fact his! Subsequent investigation revealed that not only was the chain of evidence critically broken, but it also seems that certain parties were involved in purposefully falsifying results! Read about it here. In an attempt to pin such a blood sample on Henri Paul the plotters had to create a picture of an individual who was a chronic alcoholic in the mind of the public. This image of a chronic alcoholic was also the plotters key to explaining how Henri Paul could apparently function normally whilst heavily intoxicated! The basis being that after longterm exposure to a drug (in this case heavy use of alcohol) the body adapts by recalibrating itself through a build up of tolerance to the drug enabling the individual to function normally...just so long as they routinely get their fix! Henri Paul would have had to imbibe a good amount of alcohol every single day to avoid withdrawal symptoms which in the case of booze characteristically manifest as delirium tremens, otherwise known as the DTs or the shakes; as the name (the shakes) implies, this particular withdrawal symptom commonly has the afflicted individual twitching uncontrollably! Other symptoms of delirium tremens include visual hallucinations, confusion, agitation and a moderate to severe degree of disorientation. Certainly these are not characteristics that Henri Paul showed at any time and it is unthinkable to believe that he could have been so afflicted without anybody ever having noticed! If Henri Paul were truly a chronic alcoholic as we were made to believe then surely the autopsy conducted on his body would have revealed at the very least some evidence corroborating such fact! But guess what? There was no such evidence; no trace or hint of liver damage as is routinely found in alcoholics! In fact what is particularly interesting is how the private lab (Dr. Pepin's Lab) that conducted the analysis of the two contentious blood samples (the ones that magically appeared from nowhere and then just as magically disappeared after "proving" that Henri Paul was drunk) came up with the miraculous conclusion that Henri Paul was "in a state of moderate chronic alcoholism for a minimum of one week." Not only was such a statement unsubstantiated by the autopsy findings, in and of itself, it was most strange indeed! Henri Paul Was A Licensed Pilot With Over 600 HRs of Flying Time! Nowhere is it mentioned in the official report that the supposed chronic alcoholic, Henri Paul, was an accomplished pilot who was highly thought of by his former flight instructor. I guess even the instructor was unable to recognize a raving alcoholic in spite of when sitting right next to one in the narrow confines of a cockpit! Two days before the crash, Henri Paul had passed every test required to become a licensed pilot. Hmmmm...perhaps that may explain his drunkeness; he was so ecstatic about getting his license he decided to go on an alcoholic binge! Implausible as this last scenario is, it certainly sounds more plausible than the official version that Henri Paul was a chronic alcoholic!